Home » What Should You Do During Earthquake at Work? If you are working indoors, which is most likely the case, you should Drop, Cover and Hold in case of an earthquake. This is the recommended course of action for anybody who finds themselves indoors at the time of an earthquake. Your workplace is not an exception. Moreover, every workplace in New Zealand should have an emergency plan and at least one earthquake preparedness kit available. Your earthquake emergency plan should identify strong and weak spots in a workplace building and it should also include employee training. 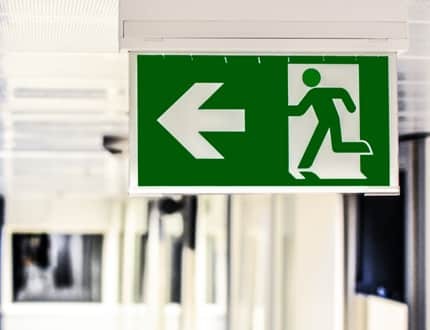 Emergency training of this sort should contain the general information that is applicable to every workplace, but also specific information for your workplace. For example, what parts of a building to avoid, where to seek cover and similar. Such training should be repeated at least twice a year. As an employer, you are responsible for dealing with earthquake-related health and safety risks. This is all part of workplace earthquake preparedness. What Is the Earthquake Preparedness? Workplace earthquake preparedness involves all the measures, plans and actions taken to minimise the effects of a possible earthquake. These measures are put into place to prevent employee injuries, damages to the workplace and even business contingency (frequently mistaken for continuity). Obviously, safety of your staff comes first, so you need to try and prevent as many injuries as possible in case an earthquake strikes. Besides making such plans, you should also make sure your employees get proper emergency training and also that you have your emergency kit for earthquake in several places in your workplace. Some guidelines also recommend that your employees keep their own personal earthquake kit that they can grab in case they need to evacuate immediately. What Should Be in an Earthquake Preparedness Kit? Earthquake preparedness kit in NZ workplace needs to be equipped with first aid supplies, some tools, sanitation supplies, food and water. Earthquake kit lists should also include tools such as radio, protective equipment, torch and the like. First aid kit is needed to minimise the injuries employees might have suffered during earthquake. Tools can be used to manage cut electrical wires, turn off water and gas and much more. Food and water should be enough to sustain a person for 72 hours. Sanitation supplies are also needed in case there are people trapped inside their workplace for prolonged periods of time. The need to mobile phones, spare batteries, radio and other communication devices is obvious. People should be instructed not to call emergency services if they are not injured. Check radio stations for further instructions. Where Do You Hide During Earthquake? Usually, when the earthquake starts, you should drop down on the floor and find shelter below a desk or similar sturdy and resilient piece of furniture. You should assume the “turtle” position and protect your neck. There is no time to make big decisions once an earthquake starts. That is why it is highly recommended that workplaces pre-determine the best spots for cover and that all employees know about them. Usually, in offices, the best place for cover is under a strong desk. If all the desks are of low quality, the best option is to curl up next to the interior wall, away from the windows. In big warehouses that have a lot of shelves, it is best to crawl under the bottom shelves. While the items from the top shelves may start to fall down, the bottom of the shelves will move the least and the shelve itself will serve as a cover. Running through the aisles increases the chances of getting hit by falling objects. The earthquake itself can last for several seconds or up to one minute. However, that is only what happens in the epicentre. As earthquake shocks spread like waves, the shaking may last longer as the earthquake spreads. However, it will also be weaker. An earthquake is usually felt for a couple of minutes only. How long and how much an earthquake is felt depends on the distance from the epicentre and the strength of the earthquake itself. You will feel less shaking in the building lobby than you will on the 10th storey. Aftershocks are smaller quakes that usually happen after the main quake. They are more likely to happen if the earthquake was shallow and closer to the surface. Aftershocks can happen within a matter of hours, days, but also weeks. What Should We Not Do During Earthquake? Remember your training and follow the usual steps of drop, cover and hold until the earthquake is over. Once the shaking stops, be prepared that some of the items and objects will still be falling down. If somebody in your surrounding is hurt, reach for the earthquake kit and get the first aid supplies from it. There should be a torch inside, as well, in case there is not enough light. To make sure your earthquake kit for NZ workplaces is well stocked and always up to date – you need to check it and replenish it regularly. This can be a tedious job and it is easy to forget it. Now, you can freely forget about your earthquake emergency kit and get Alsco New Zealand to worry about them. Alsco New Zealand has decades of experience in assembling and maintaining any earthquake survival kit a NZ workplace may need. We rent the earthquake kits for an annual fee and we maintain them, check them and replenish them for the same price. Call Alsco representatives and get your best quote for emergency kit for earthquakes that match your workplace needs and specifics.